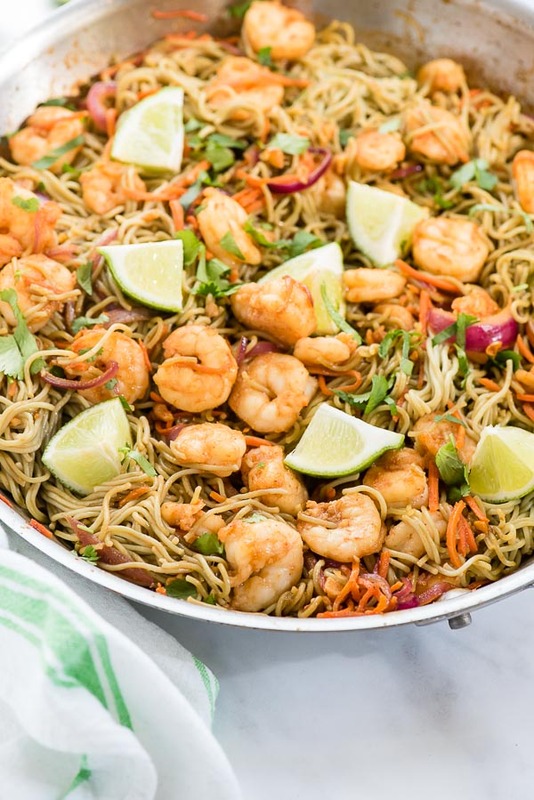 Spicy Noodles with Dragon Shrimp: Ready in 20 minutes! 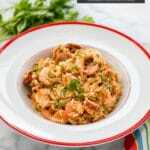 Home » Main Dishes » Dragon Shrimp & Spicy Noodles: Spicy, Sweet & on the table in 20 minutes! 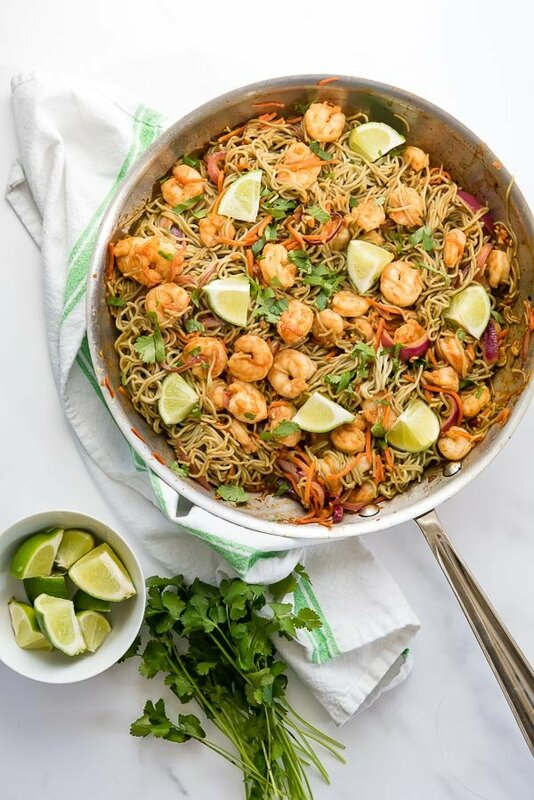 Spicy Noodles with fiery-sweet Dragon Shrimp are flavor-packed and on the dinner table in 20 minutes. An easy recipe for an irresistible main dish. 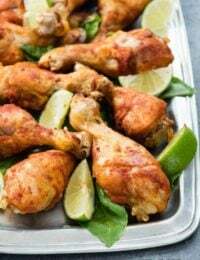 I love fast, easy dinner recipes, that are also packed with flavor. Throw in some old-school comfort food and you have Spicy Noodles with Dragon Shrimp! This is NOT the ramen you ate in college but does deliver the same satisfaction and speedy preparation! This filling main dish is packed with wholesome ingredients and great flavor. What is Spicy Noodles with Dragon Shrimp? Spicy Noodles with Dragon Shrimp is a modified stir-fry recipe. If you have a large skillet, you are good to go! 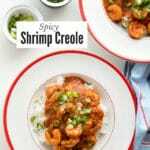 This recipe combines ginger, garlic, red onions, shredded carrots, sautéed with shrimp and a spicy, sweet, tangy sauce you’ll love! Different Dragon Shrimp recipes include slightly different seasonings, and more or less vegetables. The finishing touch in this spicy noodle recipe is tossing it all with prepared ramen for a hearty recipe that has great texture. 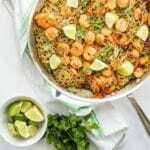 Finished with torn cilantro leaves and served with lime wedges for a squeeze of some citrus and Dragon Shrimp Spicy Noodles is a filling and tasty recipe. For those who don’t love the prepared seasonings that come with ramen, never fear! 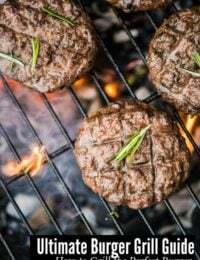 The flavor packet is not used for this recipe, so the flavor comes exclusively from the homemade spicy Asian sauce. 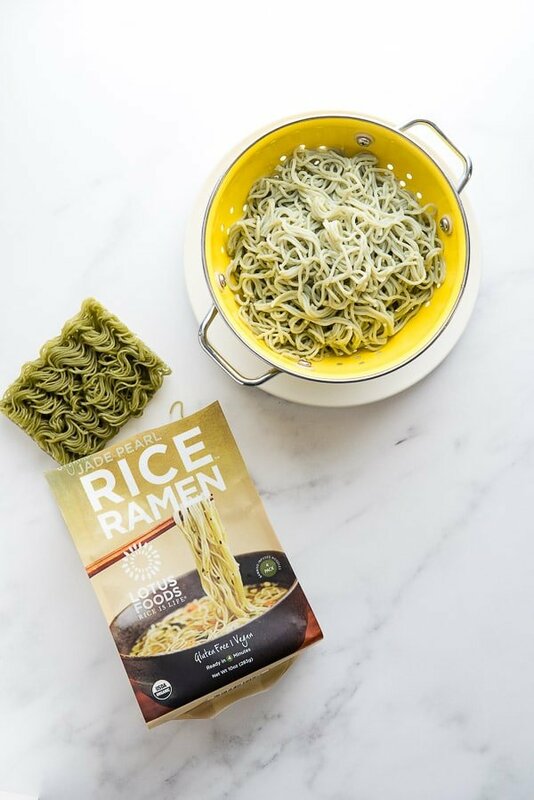 New Find: Gluten-Free Ramen Noodles! When I envisioned this recipe I really wanted to make it with ramen. I’d purchased some fresh gluten-free ramen noodles from Amazon.com last year that was fresh sealed in a bag ready for quick boiling. It was moist unlike the typical ramen which is dry and squiggly, unraveling in boiling water to make wavy noodled with a fantastic texture. I found a brand of gluten-free ramen at my Whole Foods that is made from rice. It cooks wonderfully and comes in different types of rice making each variety a different color. I thought this Jade Rice Ramen was a wonderful shade to compliment the pink cooked shrimp although any . The ramen has a nice flavor, and texture; it keeps its structure after cooking which not all gluten-free pasta brands do. I did find the ramen cakes to be smaller in the gluten-free brand so use 4 instead of two regular size gluten ramen. What is the Shrimp ‘Count’? 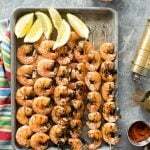 When buying shrimp, either fresh or frozen, you’ll note there is a count number associated with the shrimp. This number indicates how many shrimp there are in a pound! The larger the number the smaller the size of the shrimp and visa versa. Shrimp change color when they are cooked! The shrimp will turn from gray and translucent when raw, to light pink (or white depending on the type) and opaque in a few minutes over high heat. TIP: Don’t overcook or it will become rubbery in texture. Multiple actions happen at the same time with this spicy noodle recipe, so preparation is a key to success! While the water is boiling and the ramen cooking, the other ingredients can be prepped and the sauce made. The actual cooking of the full recipe takes about 10 minutes! Prepare the ramen as indicated on the package. DO NOT use the included flavor packet. In a large skillet cook the diced garlic and ginger over high heat until softened and aromatic. 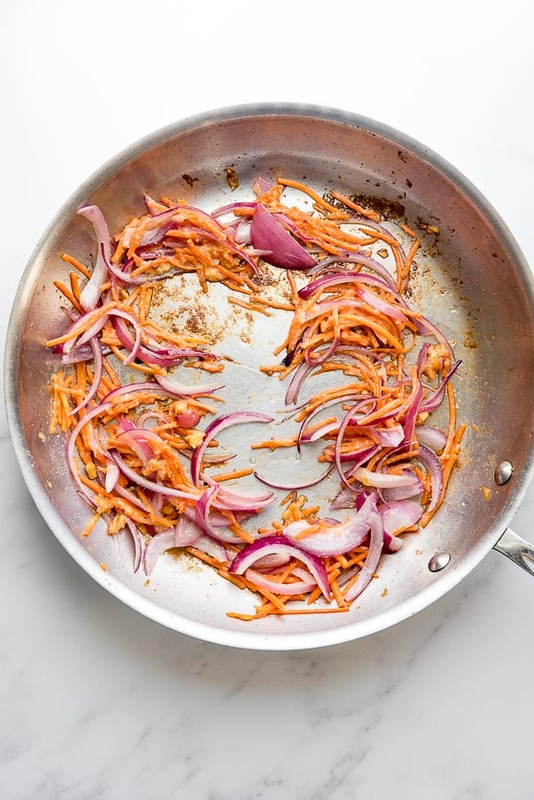 Add the shredded carrot and red onion slices and briefly sauteed. Add the shrimp and cook just until done. 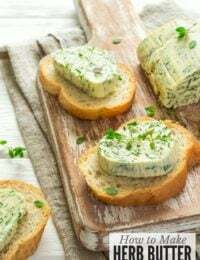 Instead of dicing fresh ginger and garlic, use stir-in paste style equivalents. They are fresh and sold in the produce section in tubes. Total timesaver. If you can’t find stir-in paste, use a mini chopper to quickly dice the garlic and ginger. Purchase already shredded carrots which saves time doing it yourself. 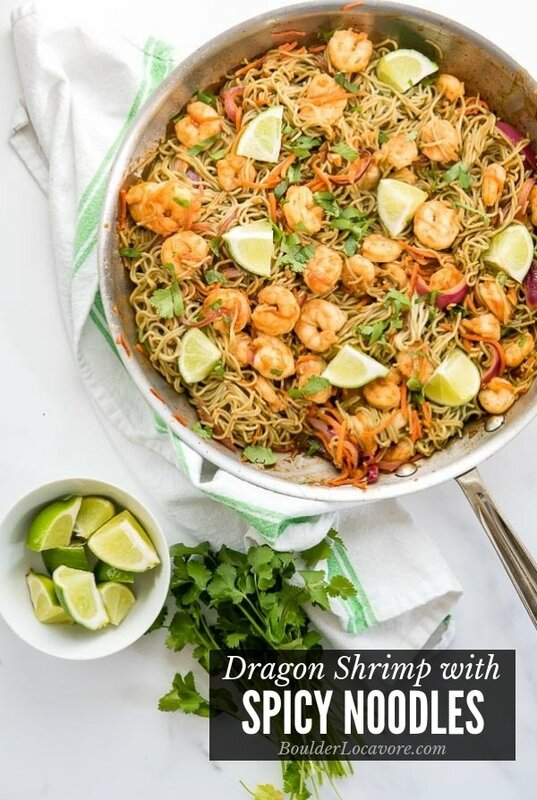 If you’ve tried this Dragon Shrimp Spicy Noodles recipe on BoulderLocavore.com please RATE THE RECIPE below! 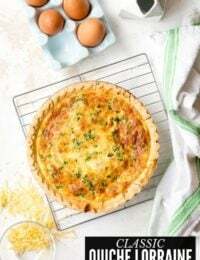 This recipe is easy to prepare with a handfull of ingredient that cook quickly. 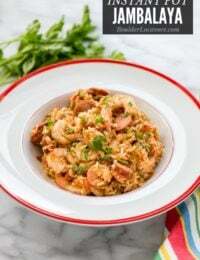 The end result is a spicy, sweet, salty flavor with a great bite of shrimp in satisfying ramen noodles. Prepare the ramen noodles per package instructions. Do not use a flavor packet if included. While the ramen is cooking, prep the vegetables and combine the ingredients for the sauce; stir to combine fully. While the cooked ramen noodles are draining, heat the oil over medium-high heat in a large wok or skillet. Add the ginger and garlic and cook for 2 minutes to soften. Add the carrots and onions to the skillet. Saute just until the onion begins to soften; 1-2 minutes. Remove from the skillet onto a plate or bowl. Add the shrimp to the skillet and saute, picking up any browned bits from the vegetable sauteeing. NOTE: additional oil may be added if needed. Cook until the shrimp become opaque and pink or white (depends on variety used). 3-4 minutes. Add the vegetables back to the skillet and stir/toss to combine. Pour in the sauce and stir to combine. Add in the ramen and toss to fully combine. Serve hot with suggested garnishes. 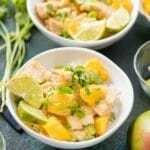 Instant Pot Mango Chicken: Fast, Light and EASY! Love how easy to make these noodles are! Pinning to try them! This is right up my alley! I didn’t realize at first (on FB where I saw this) that you used Ramen noodles! 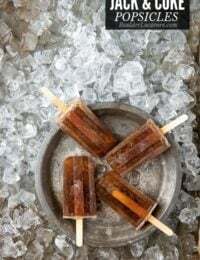 I love that, and have some in my pantry all ready to go!! This is saving me from needing to order take out! Now, this was a perfect weeknight dinner. My family loved it. I am loving on that sauce! So easy to make. 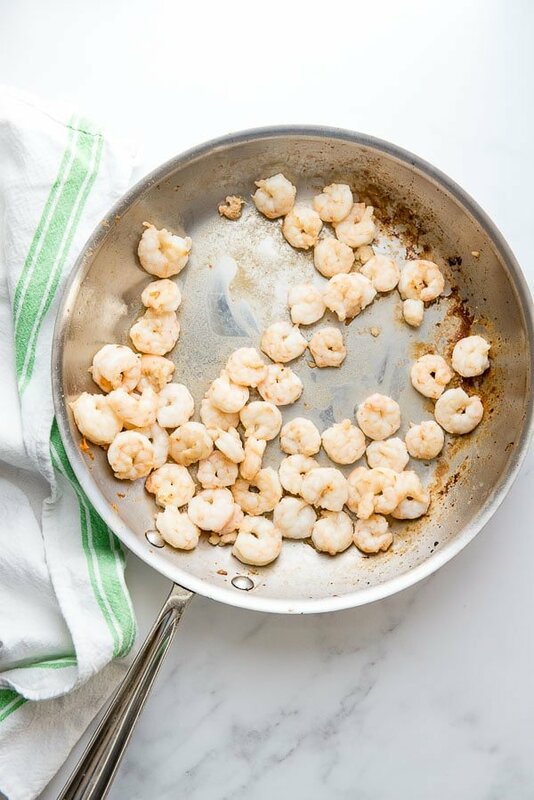 Love all the tips about cooking shrimp. This is my new favorite pasta dish! !